Sometimes a piece of wood simply begs to be treated differently. It might be an unusual shape -- and many trees grow in odd locations, causing them to twist and turn around physical obstacles, or bend as they seek out light. On the next page is an example of something made from such a piece of wood. 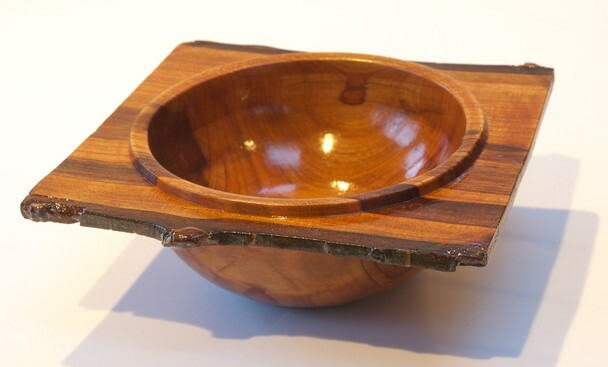 But odd shapes are not the only reason to do "something different": sometimes there is a pattern of grain and figure, heartwood and sapwood, light and dark -- a pattern so attractive that it calls for (and deserves) a better display than a thin-rimmed bowl would provide. There are several possibilities, one being to leave part of the wood at its original size (for example, the square surface of a log cut in half vertically) and turn away the wood around it. Here is a "square bowl", made from a Japanese ornamental cherry that fell victim to a heavy snowstorm a couple of years ago. 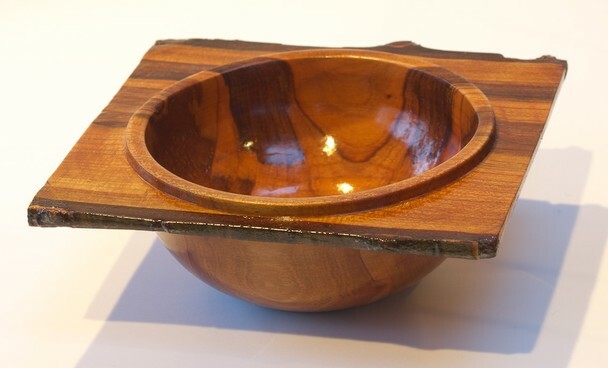 Above and left: a "square bowl" made of Japanese Cherry.